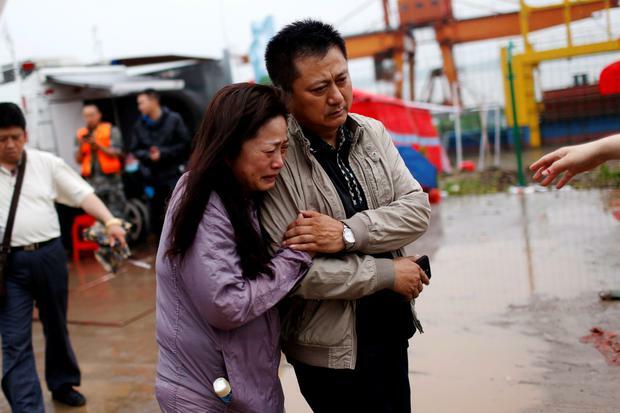 Disaster teams have recovered 77 bodies from a capsized cruise ship in the Yangtze River. They are now preparing to use cranes to start pulling it upright to quicken the search for more than 360 other victims who could be trapped inside. The operation to right the Eastern Star shifted the focus from finding survivors more than 72 hours after it overturned to salvaging the vessel and retrieving bodies. Transport Ministry spokesman Xu Chengguang said divers would put steel bars underneath the ship, which would then be lifted by two 500-ton cranes. A huge net has been placed near the cranes and another one a few metres downstream to catch any bodies. Authorities say 14 people survived Monday night's sudden capsizing in a severe storm, some by jumping from the ship during the early moments and swimming or drifting ashore. Three of them were pulled by divers from air pockets inside the overturned hull on Tuesday after rescuers heard yells for help coming from inside. Mr Xu told a news conference that no further signs of life had been found and the chance of finding anyone else alive was "very slim." It was therefore time to right the ship to speed up rescue and recovery efforts, he said. Earlier Thursday, rescuers cut three holes into the overturned hull in unsuccessful attempts to find more survivors. More than 200 divers have worked underwater in three shifts to search the ship's cabins one by one, state broadcaster CCTV said. Rescuers pulled out dozens of bodies which were taken to Jianli's Rongcheng Crematorium, in Hubei province, where relatives tried to identify them. Many of the more than 450 people on board the multi-decked, 251ft long Eastern Star were reported to be retirees taking in the scenic vistas of the Yangtze on a cruise from Nanjing to the south-western city of Chongqing.